The first exercise is a nice problem solving task requiring that the student uses the cosine rule, angle at center theorem and some algebra. The second task leads the student to a nice proof of the sine rule. The task is available as a pdf here: Circumscribed Triangle Radius Problem. 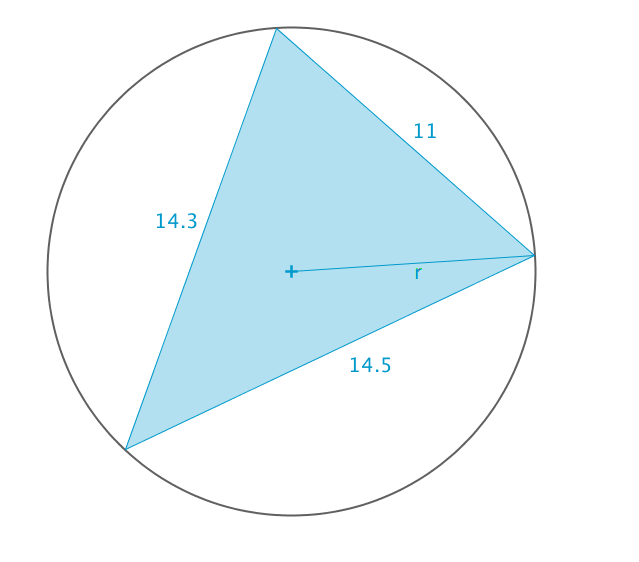 The triangle in the figure below is circumscribed by a circle with radius . Any triangle can be circumscribed by a circle. Find a formula for the radius of the circle, given the three sides of the triangle. Show that, if you haven’t already done so, that . Find a similar expression for using angle and side ; then angle and side . Hence prove the sine rule. Done here! Take me back to the triangles menu.